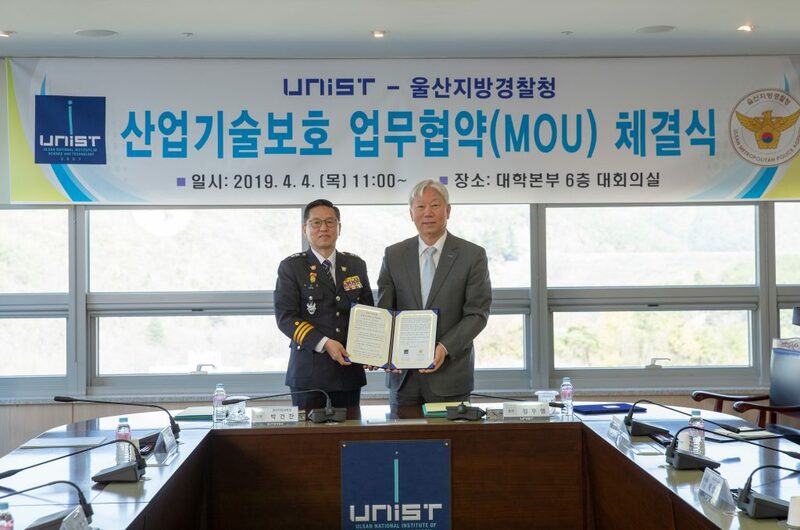 The signing ceremony of MoU between UNIST and Ulsan Metropolitan Police Agency took place at UNIST on April 4, 2019. 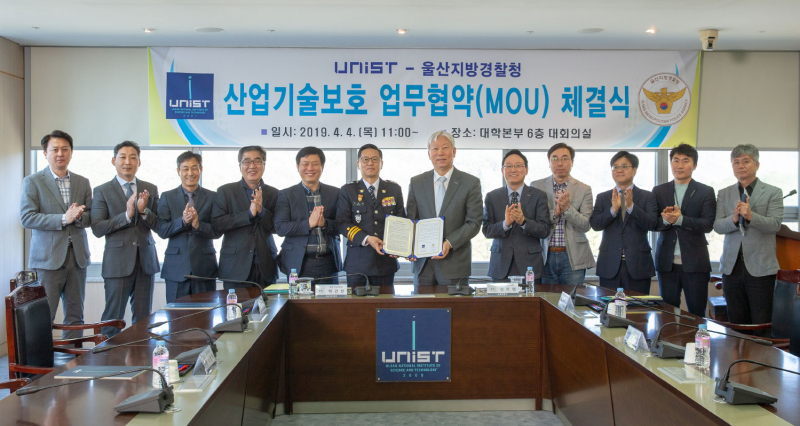 UNIST signed a Memorandum of Understanding (MoU) with Ulsan Metropolitan Police Agency to promote active collaboration and mutual assistance towards the protection of industrial technology. The ceremony took place in the 6F main conference room, located in the Main Administration Building at UNIST on April 4, 2019. During the ceremony, the two organizations promised to prevent industrial technology infringements, which aimed at strengthening the competitiveness of Korean industries and contribute to national security and development of the national economy. UNIST currently boasts 14 core technologies, which include seawater batteries, rechargeable secondary batteries, as well as solar cells. Under this partnership, Ulsan Metropolitan Police Agency plans to aggressively pursue the government’s task of ‘Industrial Technology Outflow Prevention for Protecting Jobs’ through the protection of those core technologies. In addition, UNIST will offer expert consultation on various industrial technology infringement investigations conducted by the Ulsan Regional Police Agency in order to help the police solve their cases smoothly. This is part of establishing a hotline for industrial technology protection activities. Chief GunChan Park of Ulsan Metropolitan Police Agency and President Mooyoung Jung of UNIST are posing for a portrait at the MoU signing ceremony on April 4, 2019. Under this partnership, both organizations have agreed to collaborate on the following areas: ▲ Damage prevention of industrial technology leakage & development of foreigner crime acion plan ▲ Providing intersubjective education & support for skilled and professional manpower ▲ Promoting joint campaign to prevent technology extortion ▲ Organizing foreigner participating policing and patrol activities. Meanwhile, the ceremony has been attended by President Mooyoung Jung of UNIST, Vice President JaeSung Lee of UNIST, Chief GunChan Park of Ulsan Metropolitan Police Agency, Security Manager JungHyeok Cho, as well as other related officials from both organizations.